I didn't recall how much I loved this movie. IMDB link. 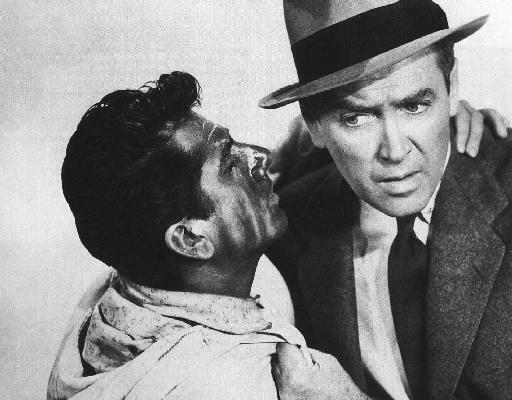 I'm now about the age of Jimmy Stewart at time he made this film and have a son the same age. This film has a lot Cold War overtones that map nicely to our current time -- a the first 30 minutes or so is set in French Morocco (which became independent in 1956). There's a little paranoia. The Americans come off as honorable and this Doris Day's most serious role. I especially like the soundtrack by Bernard Hermann. It's almost a character in the film. I've got to switch from the BackBlog comment system to HaloScan comment system which is by many blogs of St. Blog's Parish. This is unusual for a blog: to have two comment systems. I will see about how to make the old comments accessible, but there's a chance that they will not be recoverable. Immediately: begin to use Haloscan (which appears first). BackBlog is being phased-out. Lots of interesting stuff here. I hope some of it is true. PHOENIX – Catholic Bishop Thomas O'Brien apologized in court Friday to the family of the pedestrian he struck and killed in a hit-and-run accident. Bishop O'Brien, who spoke during a pre-sentencing hearing in Maricopa County Superior Court, maintained he didn't realize he hit a person, but he apologized to the family of 43-year-old Jim Reed. "I know there is no one to blame for this but me," he said. In court paperwork, prosecutors asked Judge Stephen Gerst to sentence Bishop O'Brien to six months in jail and four years of supervised probation when he is sentenced March 26. Bishop O'Brien, who resigned last summer as head of the Diocese of Phoenix, asked Judge Gerst to give him probation. He could be sentenced to anything from probation to three years and nine months in prison. Mr. Reed's family, in court for the hearing, declined to comment on Bishop O'Brien's apology. A jury found the bishop guilty last month of leaving the scene of a fatal accident. The former church leader of Arizona Catholics for 21 years is believed to be the first Roman Catholic bishop in U.S. history to be convicted of a felony. Bishop O'Brien, who didn't report the accident to police, resigned in June after he was charged in the case. He faced criticism before the accident for signing a deal with prosecutors that spared him indictment on obstruction charges for protecting priests accused of child molestation. Prosecutors weren't allowed to bring up the immunity deal at trial, but that prohibition doesn't apply to sentencing. "There is no question looking back, I wish I would have done things differently, especially with regard to issues of sexual misconduct within the Diocese of Phoenix," said Bishop O'Brien, who told the judge he's been under a lot of stress for the last several years. Tom Henze, an attorney for the bishop, said the sexual abuse cases shouldn't be considered in Bishop O'Brien's punishment. Mr. Henze said the diocese, under Bishop O'Brien's leadership, established policies in the early 1990s to address sexual abuse. the last king of England to have close to absolute rule. the last of the Stuarts. the last Catholic on the throne. In case the English want to switch from Hannover-Windsors to Stuarts, there's a Stuart tracked by geneologists ready to take the throne. I really got this one wrong. The king of The Last King was Charles II who had a long reign. The reign of James II was short. James according to the view of the producers of The Last King was imprudent and pushed England to another civil war, again on religious lines in less than four years of rule. Two young girls who ran away from their Massachusetts families for the bright lights of the Big Apple were found safe yesterday a few miles from their hometowns, cops said. Best pals Bailey Sablock, 12, and Stephanie Rita, 14, were found yesterday in Salem, Mass. The pair were thought to be headed for New York because they talked to schoolmates of their love of the city. "They're OK," Sablock's father, Christian, told The Post yesterday. "They're in a lot of trouble." Todd Venezia. There was a television news report (on Fox 5) that they were abducted and returned and they were no other details. This Post account leaves out a detail that I would have included: they had been missing since March 15. A well-regarded special education teacher was charged with scrawling racist epithets on the walls of a Queens elementary school Friday. Yolanda Moorjaney, 31, of Bellerose, was charged with criminal mischief as a hate crime after allegedly writing on the wall of a bathroom stall at PS 256 Friday morning, according to Queens District Attorney Richard Brown. Moorjaney, who has taught special education students at PS 256 for the past six years, was spotted at 7:45 a.m. Friday as she left a bathroom that undercover members of the New York Police Department's Hate Crime Task Force had under surveillance. Officers from the task force had been called into the school after receiving a complaint from school officials that over the past month and a half they had on several occasions found racists graffiti in the school. Before Moorjaney entered the bathroom, officers had determined that the restroom was graffiti-free. After she left, officers found two separate epithets for black people, Brown said. The epithets were written in black ink, and Moorjaney was carrying a black felt marker, Brown said. A law enforcement source, speaking on the condition of anonymity, said that Moorjaney did not make any statements after being arrested and that police didn't have any motive for the incidents. The source said Moorjaney's arrest came as a complete surprise to school officials who had the highest regard for her as a teacher. "It's inexplicable because she has a fine record and she's well thought of,'' the source said. "She's one of the last people they would have thought was capable of doing something like this." Moorjaney was awaiting arraignment Friday night in Queens Criminal Court. Under the Hate Crime laws, she faces up to four years in prison if convicted. Newsday is so PC they won't answer the questions that the reader has: yes, it was the n-word and the teacher is "South Asian" -- I assume that's Indian or Pakistani. Lei Witness magazine. A good photoshop parody -- from this real web site. I am writing this reluctantly. I feel a certain obligation post something on this subject. Why am I reluctant? I had an entire undergrad semester on the Doctrine of Just War and the origins of conflict, and I know of at least four people that have gotten Masters theses out it. The Doctrine of Just War is too complex to fit into either a 1000 word blog post or a 400 character comments box note. A very original and thoughtful essay. The body of a newborn baby boy washed ashore on a Raritan Bay beach Thursday. The unclothed, full-term infant was discovered about 9 a.m. near the high-tide line by a man walking the beach, according to Police Chief John F. Pollinger. Pray for this young boy and pray for an end to all infanticide in our country. We do not despair but trust in God's mercy. The Alma Mater of Fr. Benedict Groeschel CFR and myself (MS Computer Science 1980) Columbia University has modified its logo to remove the crosses. The crosses appear there because it was originally chartered as King's College before the founding of the United States, and the King is Christian and wears a Christian crown. This was reported in the New York Sun and there's no online link at present. I'll update this item with a link or my own scan of the article later. Crosses are out, shamrocks are in at the St. Patrick's Day parade in Augusta. Organizers of the Irish-American Heritage Society's parade have refused to allow a youth group from a local religious community to carry crosses in today's parade. A disgrace to St. Patrick and to Ireland. Irish identity is tied to the Cross of Christ. St. Patrick brought the Cross to Ireland at the dying gasp of the Roman Empire, and the Irish returned the favor by preserving Christianity and evangelizing the barbarian peoples of the Europe during the Dark Ages. The Irish endured centuries of hostility from its English overlords which continues to this day by its stubborn defiance and loyalty to the Catholic Church and love of freedom. Fly to Middle Earth for $848? But where? The Shire? Gondor? or (ugh!) Mordor? After a terrorist attack by al-Qaida that left hundreds of their fellow countrymen dead, Spanish voters immediately voted to give the terrorists what they want ? a socialist government that opposes America's war on terrorism. Al-Qaida has changed a government. This weekend's vote in Spain forces the world to acknowledge that terrorists ? and signs now point strongly to al-Qaeda ? have scored their greatest victory since Sept. 11: They brought down the government of a major Western democracy. The importance of the election results hardly can be overestimated. Though 90 percent of Spanish voters opposed their government's support for the U.S. war in Iraq, polls last week indicated that they were prepared to return the center-right Popular Party to power. Then came Thursday's train bombings, which a self-described al-Qaeda spokesman said was Spain's payback for helping America in Iraq. The result: a resounding win for the opposition Socialists, who announced yesterday the impending withdrawal of Spain's 1,300 troops from Iraq. The terrorists won not because the Spanish people decided to change governments. The terrorists won because the Spanish people made that decision in response to mass murder. Many voters surely reasoned like the 26-year-old vote switcher who told The New York Times, "Maybe the Socialists will get our troops out of Iraq, and al-Qaeda will forget about Spain, so we will be less frightened." That is called appeasement, and it will embolden the killers. Today across Europe, governments that ally themselves with America in Iraq against the will of their own people quake. The shortsighted Spanish electorate may have guaranteed that the Madrid bloodbath will be repeated across Europe and even America. From a terrorist's point of view, why not? It worked spectacularly in Spain. 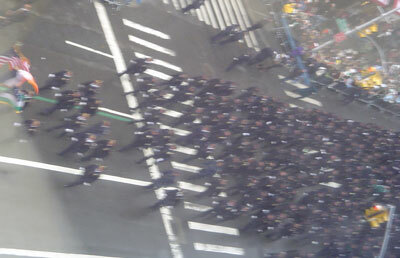 Photoblog: St. Patrick's Day Parade as seen from the Excellence in Blogging Building overlooking Fifth Ave. 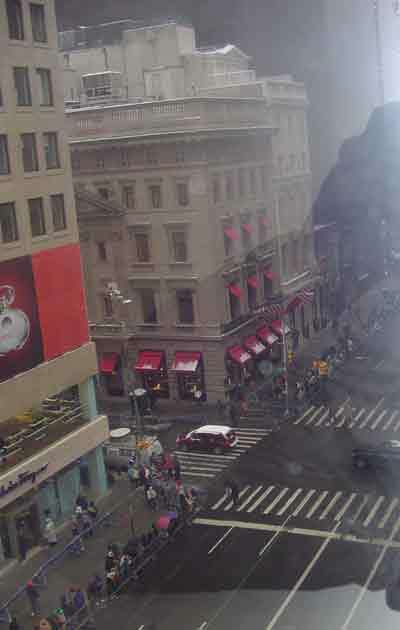 Please excuse the reflection of the window and the overcast skies. 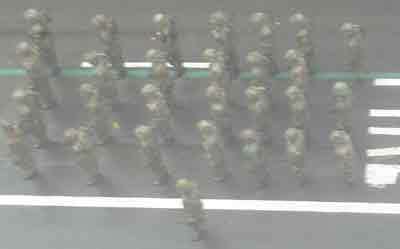 The soldiers at the start of the parade are the Irish 165th Infantry (originally the 69th Regiment of the 1850's). Many flags. 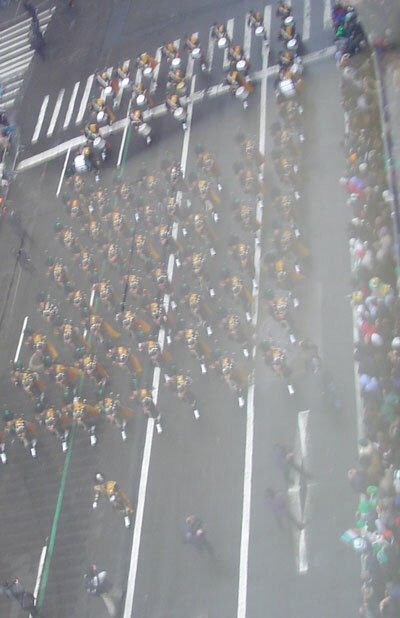 A few groups even carry the flag of Vatican City. 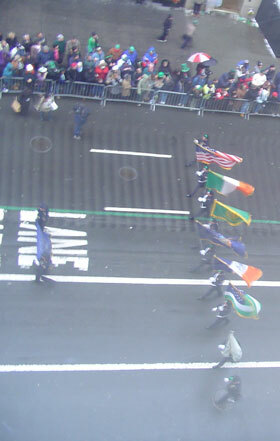 Many, many New York City police officers and firefighters are of Irish descent, even as fewer of them choose to live in the boundaries of the city. "How dare you..." appeared again, not directed to a reporter. You see the reporters that Kerry permits himself to be interviewed by are never going to ask him a tough question. Cedric Brown, not a reporter, a participant in a town hall meeting, asked senator Kerry, "Who are these foreign leaders that you've met with?" Cedric didn't get an answer, he got the old "How dare you...". What really is none of your business? I'm running for President. Foreign leaders support me, they don't support President Bush. Vote for me because I will have the support of foreign leaders. Who are those foreign leaders? Or if you are asking a question of a political candidate. Is this none of your business? Did you vote for Bush? Does the answer to the previous question have any bearning the previous question? No. Kerry's question was calculated to intimidate the questioner and incite the audience against Brown. This is phony demonstration of "toughness". is not a tragedy. It is an attack. It is not payback for Baghdad 2003 but for Tours 732 AD. The terrorists have exercised a veto on the government of Spain. Neville Chamberlain discovered what appeasement brings, let's hope that the same lesson is not taught to Spain by Al Qaeda. ...The story deepened last month when priest John Minkler was found dead in his home near Albany. He had met with Bishop Hubbard two days earlier to deny involvement in writing and sending a 1996 letter to the New York Archdiocese that claimed the bishop was part of a "ring of homosexual Albany priests." The cause of Rev. Minkler's death remains under investigation. This time they are directed toward investigators. Attorney John Aretakis said they are acting inappropriately. Mary Jo White is the independent investigator hired by the Albany Diocese to examine claims Bishop Howard Hubbard had homosexual relationships in the 1970s. White said she will also look into the death of Father John Minkler, who was found dead at his home in Watervliet in February. Minkler had served as a chaplain for the VA Hospital in Albany. Aretakis claimed investigators interviewed witnesses at inappropriate locations, such as Minkler's office in the VA Hospital, which is federal property. Aretakis also said White's investigative team won't allow him to be present when they question his clients. Since the death of Fr. Minkler is still under investigation by the real police and the real prosecutors, I wonder what White's role here is. Private investigators hired by Mary Jo White to look into sexual misconduct allegations against Albany Bishop Howard Hubbard were never given clearance to conduct interviews at Stratton Veterans Medical Center Hospital earlier this month. Hospital officials criticized part of the team retained by the Albany Diocesan Review Board Friday for having to read in a Record story that White's investigators were conducting interviews on the premises without permission. Activities related to my family took precedence over the blog Saturday and Sunday. Monday at work there was lots of action in the market so I couldn't pull myself away to blog or even read blogs. Things should be returning to normal.